Well, we have been back in North Carolina for two days now and I am finally ready to fill the rest of you all in on the end of our trip. We left you hanging as we crossed the border into Maine. So many people had told us Maine was their favorite state. We were excited to cross into Maine, that was, until we crossed into Maine. People were all over the board when you tried to ask about Maine vs New Hampshire. All the people coming south had only really been through Maine so they didn’t have much to compare it to. I think both Kyle and I were unrealistically hopeful that Maine would be somewhat easier than New Hampshire. We were sorely disappointed. Maine was hard. So hard. Kyle and I typically move at a two-mile an hour pace or faster. That had slowed down in New Hampshire and we found ourselves taking one to two hours longer to get to our destination. Much to our despair Maine slowed us down even more. The day we crossed the border into Maine we didn’t get into camp until eight o’clock at night. Then things hit an all time low the day we went through Mahoosuc Notch. 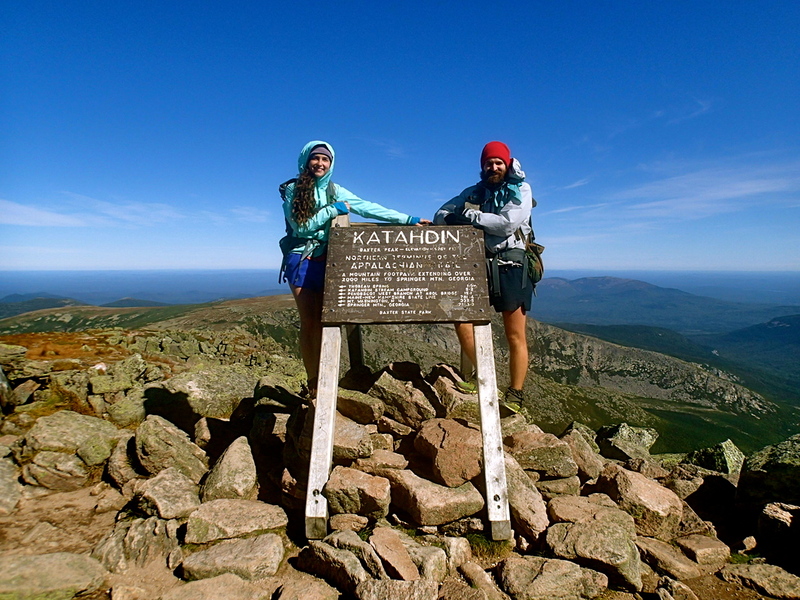 In the guide-book it describes Mahoosuc Notch as the most fun or hardest mile on the trail. The notch itself was fun, for the most part. We had to put up our poles and climb up, over, down and around house sized boulders. At times we had to take off our packs and push them ahead of us as we squeezed through cracks and crawled through holes. Our arms, which have turned into weak, scrawny sticks from lack of use, felt like jello from all the swinging and climbing we did. Every time we stood up and looked ahead we saw boulders for as far as the eye could see. The notch proved my point about Northeasters… they’re crazy if that is their form of fun… However, we made it through the notch, still smiling, until we were confronted with Mahoosuc’s Arm. I don’t know why it’s called an arm, Mahoosuc’s Cliff would have been more appropriate. I would suggest that AWOL add to the guide that Mahoosuc’s Arm is the hardest mile on the trail. That day we went fourteen miles in twelve hours. The morning after that day was the first day on trail that I woke up and didn’t want to hike. Maine continued to be frustrating and slow. Kyle’s Lymes Disease came back after he finished his first round of antibiotics. We sat on top of a Ol Blue Mountain in the middle of nowhere trying to figure out how to get him more antibiotics, a task made harder by the fact that none of the towns we would be passing through or within hitch hiking distance of had pharmacies. Miraculously, an extremely kind trail angel who lived in Rangely, a nearby town, offered to drive forty five minutes away to get his antibiotics when I called her to ask for advice. Kyle and I have never been so shocked and touched by someones kindness. Frankly, she saved our hike. To top off the antibiotic miracle, one of our fellow hikers, Chin Music, gave us enough antibiotic pills to get Kyle to Rangely. With Kyle feeling more energized we set off over the Saddleback range… in horrible weather. Didn’t exactly lift our spirits. At one point, Kyle slipped on some slippery granite, started swearing and burst out “thruhiking isn’t even cool anymore, this isn’t cool!” Safe to say he took that back later when he was in a better mood. And so Maine continued. In our guide book there was a point at which Maine appeared to become flat. Now one thing that you learn as a thruhiker is to never think (and definitely don’t say) anything positive about the trail. For example, you say, “wow, this trail is really nice right now!” and the trail will suddenly get hard. You notice that the weather has been great all day, the storm clouds roll in. You learn to never hope, never think, never even imagine that the trail is doing something nice. So even though the trail looked like it might be flat we knew not to hope. When we arrived we discovered that it was in fact “flat” but it was also rooty, rocky, muddy and rough. Despite the uneven terrain we were able to start doing bigger miles. Once we left Rangely we pushed ourselves to do at least seventeen miles a day. 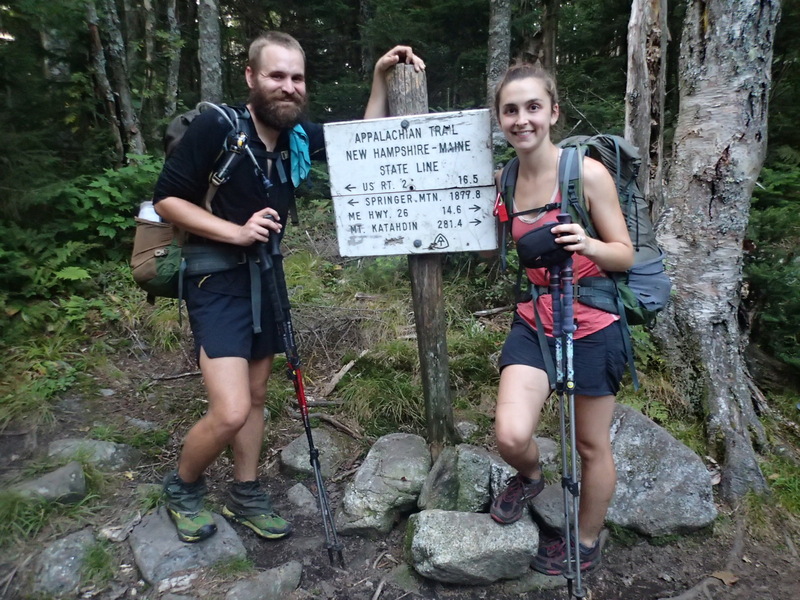 And so we rolled into Monson, the last town before the 100 mile wilderness on an eighteen mile day and were delighted to see Steph and Simon were still there, taking a zero day at Shaws Hostel. 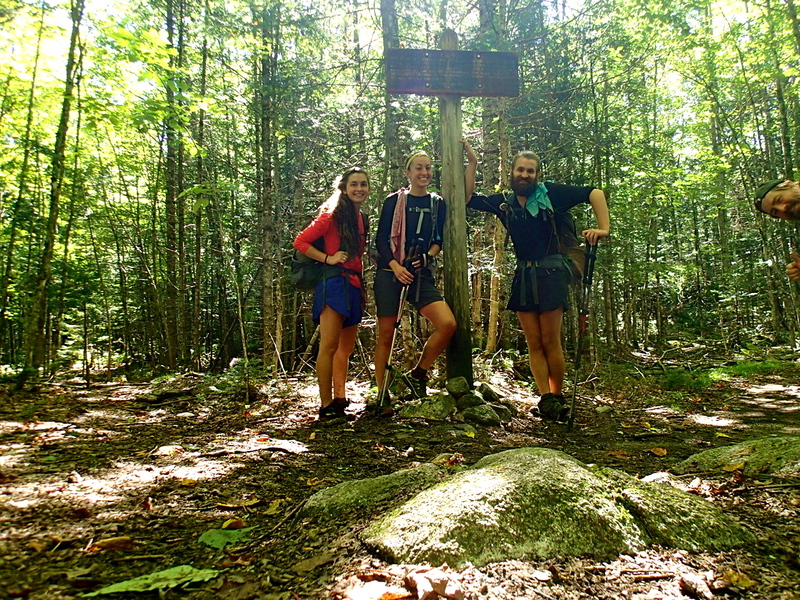 We had been hoping to catch up with Steph and Simon, our on and off hiking buddies since Irwin, TN. So with them in tow (well, technically with us in tow because they are faster hikers) we headed into the 100 mile wilderness. 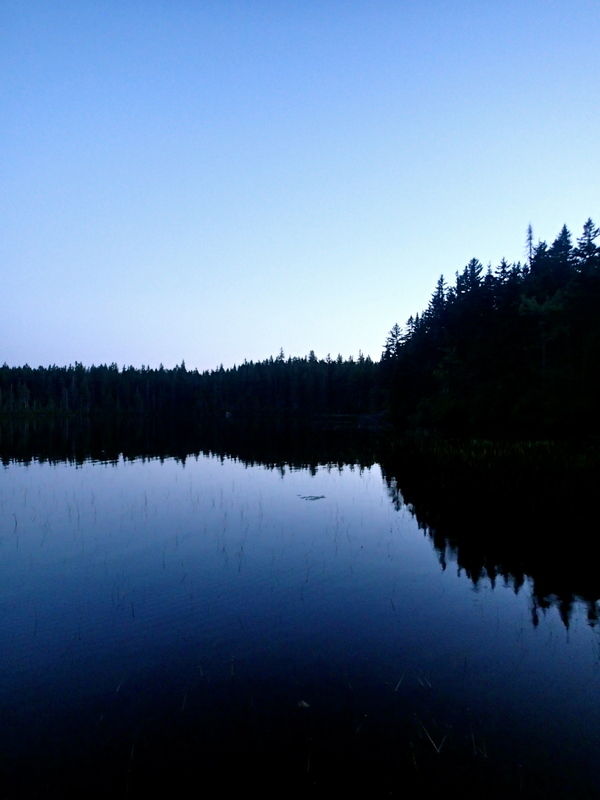 The 100 mile wilderness lived up to the rest of Maine, not in terms of terrain but by beating us down with bad weather. Our first night in the wilderness it began to rain and it didn’t stop. Our feet were wet for three days straight. We stopped taking our shoes off to ford rivers, stopped trying to dry out our socks at night. Our most disappointing moment was getting to a shelter after twenty hard soaking wet miles only to find it was already full. I burst into tears as we set up our tent and prepared for a cold wet night. We were starting to feel rather sour towards the AT when it finally presented us with a gift: perfect weather for the last three days of our hike. On our last two days before summiting we hiked a thirty mile day and a twenty-five mile day. It felt amazing to finally be able to crank out some miles and really move! 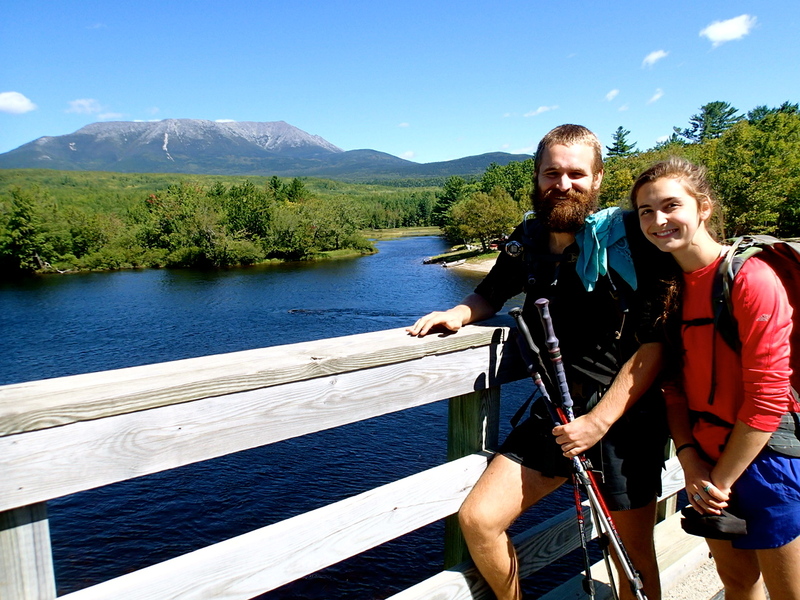 The day we reached Baxter State Park the sky was a brilliant blue and Katahdin was standing out against a stark background. It looked huge and grand. It looked like an appropriate finish line for our amazing adventure. We woke up early to a crisp September morning and began our last climb on the AT. What a surreal day. The climb up was beautiful, cold and windy, and we could see for miles. We climbed over and amongst boulders, making our way up a ridge line towards the top. We passed a chain of tourists on our way up and by the time we reached the plateau there was only one other hiker ahead of us. In solitude we reached the summit and there was the sign. The end of our trip. I didn’t even know what was welling up in side of me, it was such a mixture of emotions, happiness, pride, sadness. Ends are always hard but ending one of the greatest adventures I am ever likely to have… I touched that sign with tears in my eyes and shared a very special moment with Kyle. We made it there together and when we embraced it was a serious celebration of how strong we are and our relationship is. We hung out on the mountain as long as freezing wind would allow, experienced our last trail magic from a trail angel who hiked up food and drink for us, and when we were shaking and shivering we finally headed down. As we hiked down I kept feeling this tug in my stomach to slow down, enjoy the moment. I knew that once I stepped off the trail it would really be over. But no matter how many pictures we took or how many views we stopped at we eventually ended up in the parking lot waiting for a shuttle to Millinocket. And that was it. That was the end. Since then we have traveled home and begun to make the transition back to normal life. It took us two days to drive what it took five months to hike. During the drive we crossed over the trail twice. Already I feel so far away from the trail, from our lives there. Only my aching joints remind me of what we just did. You might be wondering what is going to happen to this blog now… well, we have a few more stories from the trail to tell that we weren’t able to share and we certainly aren’t done having adventures. So hopefully if you have enjoyed reading you will continue to check in and see what we are up to, plus, there just might be other long trails in our future. Awesome. Now, I want to plan to do the AT!!!!!!!!!!!!! Well for cry out loud~you don’t it! Yeehaw and Yahoo!! Your godmother and godfather are duly impressed and very proud of you. And quite grateful you are both safe and sound. We’d love to have the whole Falkenburg clan for a celebratory party when ya’ll return West. Kisses, hugs, love and very best wishes to you both. Your dad and I couldn’t be prouder of you both. I was busy getting ready to go to work and he read this aloud. He wept as he neared the end. We both felt the emotion of your journey – thank you for sharing so freely with us.